We love natural fibers, especially during the summer when the temperatures rise and keeping cool is a necessity. As we blogged earlier this year, linen and cotton linen blends are very popular fabrications in fashion. The natural texture adds richness to a summer wardrobe and the composition of the fabrics work well in warm climates. Now that you have a few great linen pieces, how do you take care of them so they keep their shape and last several seasons? Megan and I set out to do a little research beyond recommended use and care labels. While those little white labels are helpful (yes, please read them! ), dry clean only may not actually be your only option. See below for our guidelines and what we recommend for loving your linen. Once you know the basics, linen is just as easy to care for as cotton and can be more durable over time. Plus, the fabric gets better with each wash, unlike cotton which can become threadbare as the fibers are weakened. Linen also uses less resources in its production, which makes it a more eco-friendly fabric than cotton. You want to hand wash your linen pieces when possible with a gentle detergent, If it is a linen sports coat or structured piece, opt for the dry cleaners. Spot clean areas for a deeper clean when needed, but with its natural structure linen will break down with harsh chemicals. While linen will get softer with each wash, we recommend hang drying linen pieces to retain the shape and color. If you have a spot to line dry your linen outside, even better! Wrinkles are just part of the linen lifestyle, so if you are very particular and pressed, this may not be the best choice for you. Keep in mind that most plant-based fibers are known for their structure, but not necessarily their bounce back retention. Expect linen to shrink up with wash and release and stretch with wear. Higher quality linen will have a stronger weave and fiber that will not lose as much shape, but change is to be expected. 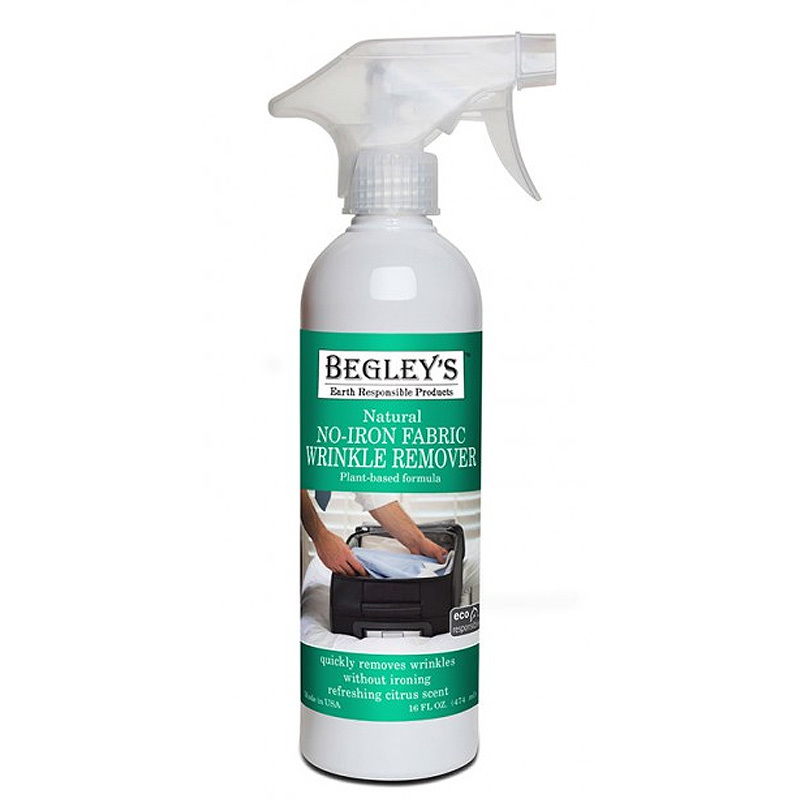 We always recommend investing in a good steamer to release wrinkles and keep your garment looking crisp. Pro tip: Steam items inside out to protect the finish of the fabric. Additionally, steaming inside out will lessen the likelihood of scorching or bleaching out dye from your linen. Linen items will wrinkle if stored in dresser drawers, so opt to hang them in your closet instead (this will save your from steaming items before each wear). Use sturdy velvet or wooden hangers to help the linen items maintain their shape. When it comes to storing your linen pieces, you want to avoid plastic bags, cardboard boxes, or cedar chests. Linen naturally has insect repellant properties, so you don't need to worry about moths or other insects creating unwelcome holes in the fabric. When you take linen out of storage, give it a good airing and wash if it needs a bit of a refresh. 1. Remove your linen jacket while driving or during extended periods of sitting. Keep a hanger in your car and behind your office door to hang your jacket until you need to wear it again. 2. Linen pants tend to wrinkle easily. To reduce fabric stretch, sagging, and extra wrinkles, gently lift your pants from the knees as you sit down. 3. Keep a small bottle of wrinkle release spray in your desk or purse. Spritz it on the fabrics and gently tug to release any wrinkles mid-day or before heading out at night. Posted on June 1, 2018 by Kimberly Gant and filed under Tips & Tricks and tagged linen wrinkle release spray linen care linen storage. We have been particularly motivated lately to organize and clean up both our work and living spaces. Kimberly has undertaken the task of not only organizing her large walk-in pantry, but also editing down her wardrobe with only pieces she wears. I've been doing small home improvement projects, and am finally making an effort to transfer all of my shoes to plastic shoes bins to keep them dust-free and organized. 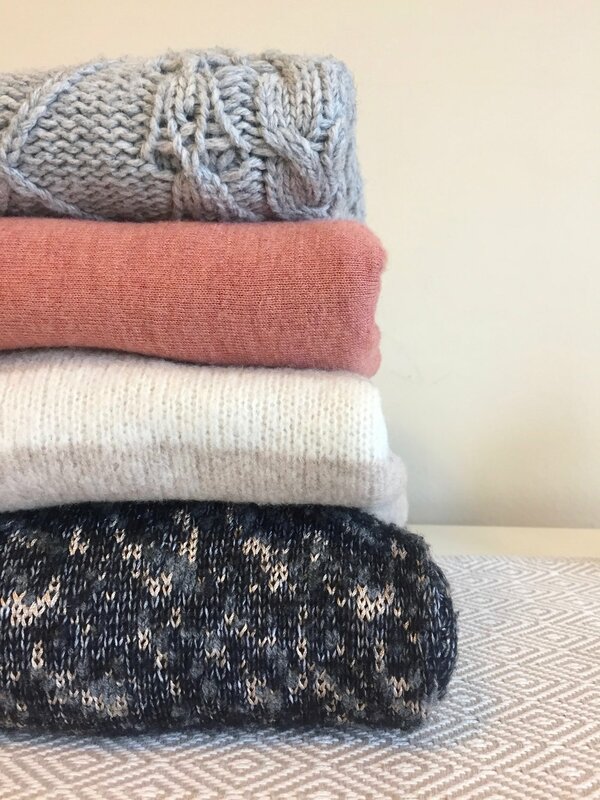 The new year is alway a good opportunity to go through your entire closet and see what's working, what you aren't wearing anymore, and what can be put away until spring. Not only does the cold, rainy weather give you the perfect excuse to stay inside all day, but you will feel much lighter having organized your belongings. Think about your space as a "work space". Organize things by use and simplified natural flow. At the end of the day do you take off your jewelry before going to sleep? We recommend this to keep jewelry cleaner longer. Why not add a dish to your night stand for a stylish catchall. Pro tip: Many stores will be having sales on organizing items in January, so take advantage of them!...do a quick web search to see stores near you with promos like Target, The Container Store, and Bed Bath and Beyond. So, in the spirit of out with the old and in with the new, here are our 5 stress-free steps for cleaning out your closet. 1. Assess Your Current Style and How it Translates Through the Clothes in Your Closet. If you've become less edgy and more classic, it may be time to replace distressed jeans for tailored black pants. 2. If You Haven’t Worn it in at Least Two Years, Then it is Time to Let it Go. We always tell ourselves we may need it one day, for that one event, but chances are it will just end up sitting in your closet for another 2 years. Exercise tough love, and let go of anything that hasn't made its way out of the closet in the past 2 years. Someone else can likely use it! 3. Hold on to Heirloom Pieces. We all have those special pieces that we don't wear, but that have sentimental value (the dress you wore on your honeymoon or the vintage blouse that belonged to your mom). Take any heirloom pieces from your closet and store them in an airtight bin. This will help preserve them and free up room in your closet. 4. Ditch Wire Hangers. Wire hangers are tough on your clothes and can stretch them out. Opt for felt or wooden hangers instead to preserve their shape for longer. Plus, while you're busy swapping hangers you will get a good look at what's hiding in your closet. Need a few tips on how to hang? See our sweater blog here. 5. Organize by Category. Organize your closet so that all of your pants, shirts, skirts, etc. are arranged together. Then take it one step farther and organize each category by color. It may be time consuming at first, but it save time later when you aren’t digging around for your favorite top. Posted on January 12, 2018 by Megan Zatko and filed under Tips & Tricks and tagged closet cleanout NYE resolutions. Here at the Canvas office, we get pretty excited about giving gifts to our loved ones. And since we spend so much time in stores, we usually have our holiday gifts picked out months in advance. Realizing that not everyone shops quite as often as we do, we have gone ahead and put together our top gifts for parents, siblings, babies. In a range of prices and styles, these are all gifts that we've either already purchased for a loved one, hope to receive under the tree or just really think are awesome. Enjoy! 1. Nescafe Dolce Gusto: This little machine makes some pretty incredible coffee, including espressos, macchiatos, lattes, iced drinks and more! The best part is that you can control the strength of each brew so that it's exactly how you want it. 2. Soothe In-Home Massage: After the last dish is done and the wrapping paper is cleaned up, have Soothe come to your parents home for a little pampering. They offer a variety of massages starting at $119 an hour, and best part is that the tip is included in the price. 3. UGG Slippers: Perfect for curling up in front of the fire with a good book or glass of wine, mom and dad will love the ultimate in cozy slippers... especially if they live in a colder climate! 4. Awkward Moment Card Game: Perfect for family gatherings, this is the card game for people who don't like card games - it's that fun! A few inside family jokes are guaranteed to come out as well. 1. Brooklyn Brew Shop, Beer Making Kit: I love a gift that can last throughout the year. A beer making kit is great if you know a guy (or girl!) who likes to get theirs hands a little dirty while learning something new. This kit comes with all the supplies and ingredients you need to make your own tasty concoction. The Chocolate Maple Porter is the perfect flavor for the winter season. 2. WEKAPO Inflatable Air Sofa: The first time I saw one of these, I was at a park in Europe and they were everywhere! Flash forward a year, and you can’t step a foot into Delores or Fort Mason Park without running these things. Perfect for hanging with friends, camping and just about anywhere you can think of, it packs small and only requires fresh air and a little muscle to blow up. 3. Marcato Atlas Pasta Machine: Who doesn’t love fresh pasta? All you need is an egg, some flour and a little elbow grease to make delicious, restaurant-quality pasta dishes at home! If you have any foodies in your life, this will be a hit come Christmas morning. 4. Happy Socks Gift Box: As silly as it may seem; socks make the perfect holiday gift! When you’re unsure of what to get, a few pairs of fun dress socks are always a crowd pleaser. Happy Socks makes all kinds of fun prints, and their gift boxes make for easy wrapping. The Pout Pout Fish by Deborah Diesen : This colorful book is one of my niece's favorites about a little grumpy fish who learned that a frown is an upside down smile. Sometime's we all need that reminder to change our perspective. Atlas Of Adventures by Rachel Williams: This book is great for older kids (and kids at heart) with a taste for adventure. Each section highlights a notable place in the world, what you'll see there, along with plenty of activities and challenges. 2. Ballerina and Brother Mouse: I love this line of simple and soft toys. The Nutcracker is a family holiday tradition, so the mice can tie in in a small way. You can pick up some of these cuties at the aptly named SF toy store, Tantrum. 3. The Things I Know Matching Game: When I give gifts to kids I like them to serve a larger purpose or be educational (yes I am THAT Aunt). This colorful game is perfect for young elementary school kids. 4. Daisy Cookware Set: Sometimes you gift things you want yourself. This happy little set comes in a reusable box that has a pretend double burner designed to inspire hours of play (i.e. keeping busy hands occupied) whipping up culinary delights. Posted on December 13, 2017 by Megan Zatko and filed under Stylish Living, Tips & Tricks and tagged 2017 Holiday Gift Guide Gifts for Parents Gifts for Siblings Gifts for Mom and Dad Gifts for Babies.